Full disclosure: I only read about a third of this so this is really more my impressions than any full, impressive book review. 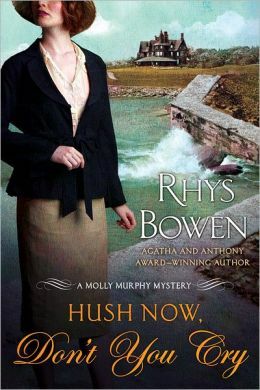 Rhys Bowen is an award-winning mystery writer with dozens of books, and this is the 11th in her Molly Murphy series – and also my introduction to her writing. But look – this just wasn’t very good. Molly, an Irish private detective in a world in which lady detectives are an anomaly, has just married a New York City senior detective and the two are off on their honeymoon to an acquaintance’s estate on Rhode Island. Shortly after arriving, their host turns up dead, and the two are naturally pulled into the mystery of solving his murder. I would have had more patience had this actually been set up as a gothic mystery. Victoria Holt and Mary Stewart both write wonderful, atmospheric gothic mysteries laced with suspense and romance. World-building, however, is crucial to this novelistic sub-genre – you must create a physical setting that is convincingly spooky, odd, shadowed, and populate it with charismatic or at least compelling figures. Hush Now, Don’t You Cry alas awkwardly draws on some of the tropes of gothic novels without apparently realizing how over-used they are, and sets up an inherently dull plot without any unique elements at all. Every part of the setup has been done a thousand times before. Molly and to a lesser extent Danny are charming, but the plot positively drags – in the first 100 pages, exactly one thing happens – the murder. Nothing else. Moreover, the dialogue is overly long, often extending a paragraph-length for each character and acting primarily as exposition, though there is some cute banter now and then. The dialogue and character-building had a lot of potential so I’m mildly interested in checking out Ms. Bowen’s Spy series which she’s best known for – but I wouldn’t recommend this novel and have no desire to check out any of the other Molly Murphy mysteries. Good elements do not a good novelist make when it’s the style that’s the problem.